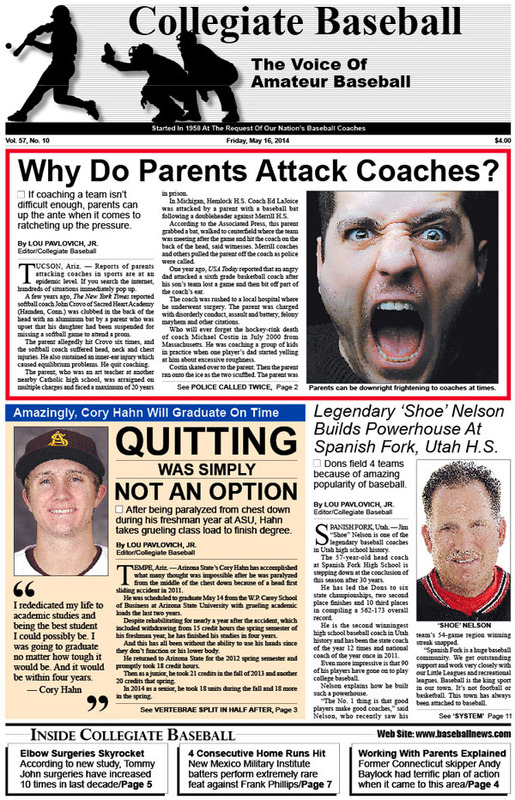 • Why Do Parents Attack Coaches? If coaching a team isn’t difficult enough, parents can up the ante when it comes to ratcheting up the pressure. • Cory Hahn of Arizona State graduates on time after being paralyzed from the chest down after sliding head first into second base during his freshman year. • Legendary “Shoe” Nelson builds a powerhouse program at Spanish Fork HS, Utah. • Tommy John surgeries up 10-fold in last decade. • Coaches suspended after multiple ejections. • Editorial: Elbow surgeries are an alarming epidemic facing young pitchers. • Special column: Parents don’t have to be coach’s enemy. • Ruleball With Rich Marazzi: When catcher’s interference called, play is alive. • Collegiate Baseball’s National High School Poll: Lambert HS, GA is No. 1 with 28-0 record. • High School Notes: Buster Kelso of Christian Brothers HS, Tenn. is now winningest coach in Tennessee history. • NAIA Notes: Chad Ellingson throws 179 pitches over 15 innings during 1-0 victory for Presentation College. • Junior College Notes: New Mexico Military Inst. hitters belt 4 consecutive homers in game against Phillips. • NCAA Division I Notes: Long Beach State’s Josh Frye hasn’t allowed a run in 25 consecutive innings. • NCAA Division 2 Notes: Will Tampa go wire-to-wire with No. 1 ranking? • Charlie Greene Instructional Clinic: Players must be prepared for anything in baseball. • Q&A: Mike Gillespie, Hall of Fame head coach at U.C. Irvine, explains unique strategies he uses in games, including steal of home and utilizing 5 infielders. • Tom Kovic: With colleges so expensive, financial aid is hot topic. To order the May 16, 2014 edition of Collegiate Baseball or subscribe, CLICK HERE.